This Is One Of The Prettiest Honey Dish Sets We Have Seen. Made From A Non-Tarnishing Pewter The Three Piece Set Is Finished With Shades Of Blue And Green. A Clear Finishing Coat Preserves The Colors. The Apple Dish Holds The Honey While The Cute Serving Spoon Is Finished With A Flower And Bee At The Top. 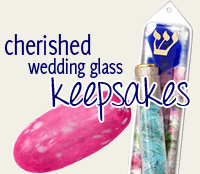 See More Jewish Gifts And Home Accessories From The Quest Collection.